Hercules launches new and innovative DJ solutions to get you started mixing! Hercules is driven by its passion for music and its desire to bring DJing to the masses, now more than ever before, and is proud to announce its new range of DJControl Inpulse controllers and the new and improved version of its DJ software, DJUCED®. Specially designed to introduce and teach the art of DJing, Hercules' promise is clear: a new and innovative solution that will simplify the beginner's journey and allow him/her to easily acquire and master DJ skills. The mood is set. Hercules is adding a new dimension to learning how to become a DJ by focusing on the importance of training one's ear. The first technique that all professional or aspiring DJs must have mastered is beatmatching. The most important rule of mixing is to match the tempo of two tracks so that they can be played in a seamless sequence without breaking the rhythm. That's why Hercules has developed a unique range of two controllers: the HERCULES DJCONTROL INPULSE 200 and the HERCULES DJCONTROL INPULSE 300 which are equipped with a "beatmatch guide". If it is enabled, the help arrows along the tempo fader and below the jog wheel will light up to guide the budding young DJ through the right steps to take. This valuable aid for getting started in DJing is powered by DJUCED® DJ software, which also includes interactive help and video tutorials from the Hercules DJ Academy to teach you the basics of DJing and improve your skills. It provides direct and intuitive access without ever exiting the software. Convenience guaranteed. Please note that DJUCED® 40° has been renamed DJUCED®, effective from September 27, 2018. The new version of DJUCED® features a more intuitive and comprehensive interface, with an easy-to-use and smoother workflow for beginners and advanced users alike. All controllers that previously ran on DJUCED® 18° will continue to work, but the DJUCED® team recommends that you download the new version of DJUCED® in order to take advantage of the new update. All controllers will now work with DJUCED®. For more information: Djuced.com. The "TRENDING SONGS" feature available exclusively from DJUCED® uses the software's artificial intelligence to reveal tomorrow's hottest songs to help you prepare your new playlists and make sure you mix what's "in". ASSISTANT: suggests the best songs from your computer audio library. ENERGY: allows you to select the perfect atmosphere for the party and infuse it with the kind of energy you want. The energy level is displayed in a color going from blue (a cooler atmosphere) to red (a warm and very danceable atmosphere), which can set the desired mood at any point in the evening. The DJControl Inpulse 200 is a more compact version than its big brother, with a user-friendly and comfortable layout that makes it the perfect controller for those who are new to DJing. When it comes to mixing, it's important to have the right equipment, even for beginners. That's why Hercules has introduced a new range of active monitoring speakers with the Hercules DJMonitor 32 and Hercules DJMonitor 42. They are powerful, and ensure a near studio experience so that everyone can get off to a good start and enjoy mixing, whether in their bedroom or at their first events. The DJControl Inpulse 300 and DJControl Inpulse 200 will be available for sale from October 23, 2018. The DJMonitor 42 and Djmonitor 32 will be available for sale from November 23, 2018. 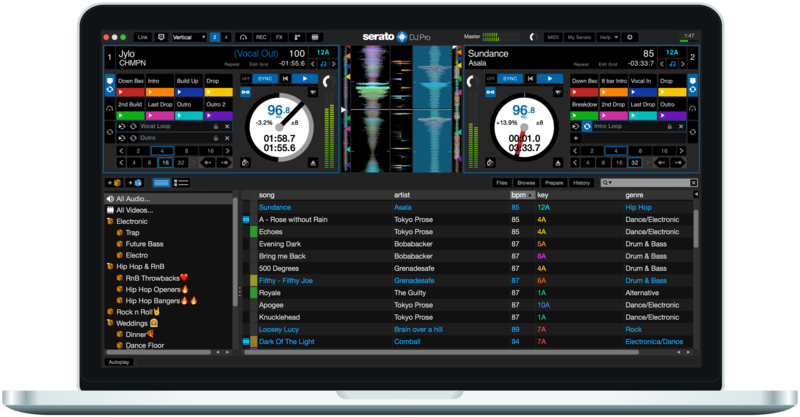 What's new in Serato DJ Pro? Practice Mode allows you to mix two tracks together with no hardware connected - ideal for testing out your blends wherever you are. 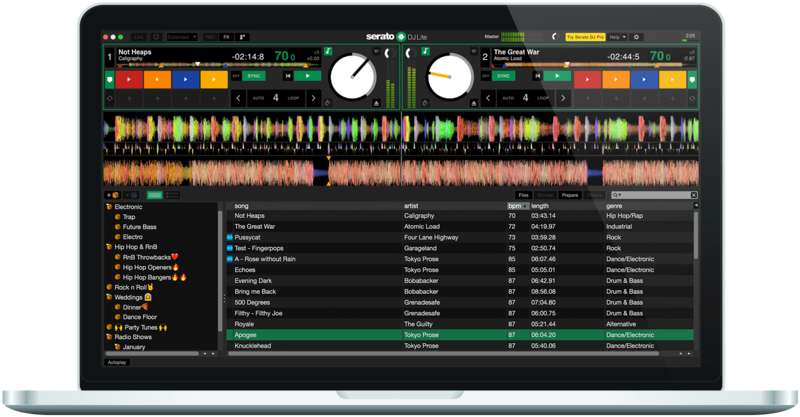 64-bit support now means Serato DJ Pro performs better than ever with virtually no limit on library size. Display your cue points in a new but very familiar layout. This makes planning and performing your routines more efficient. Serato DJ Pro has been optimised for high definition Retina, 4K and UHD displays. The new help section includes tooltips, shortcut keys and tutorials. You’ll also have the option to contact our support team, and the ability to search our knowledge base in-app. Practice Mode allows you to mix two tracks together without DJ hardware plugged in. Great if you don’t have your controller with you and feel like a jam. Serato DJ Lite has been optimised for high definition Retina, 4K and UHD displays. - if you have bought an upgrade license for Serato DJ, you can use and control Serato DJ Pro on DJ Control Jogvision. Vikk has released a tutorial in french explaining how to beatmatch 2 tracks on P32 DJ. To get the translation, click on Youtube CC (Closed Caption) button to display subtitles. 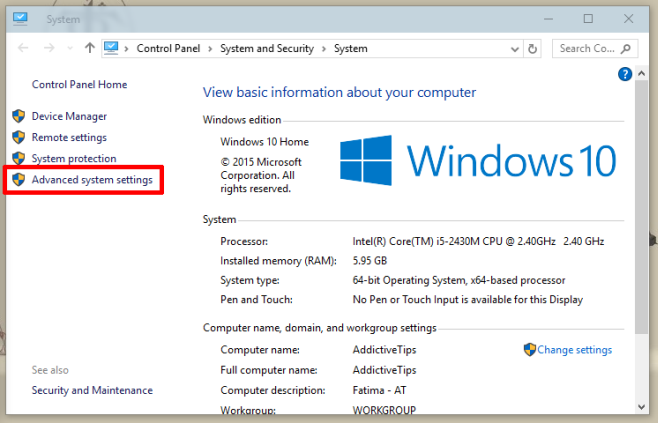 If you feel your computer in Windows is slow for DJing, you should check the following settings. 1) Switch off the Wifi, Bluetooth, and any other network connection on your computer before a DJ performance. Network connections consume CPU ressources and may cause crackles in the music. Letting the Wifi receiver switched on is the most dangerous setting for DJing on a computer, since each time the Wifi receiver of the computer detects another Wifi source, the CPU ressources of the computer will drop of 50%: if someone in the street has a smartphone with Wifi on, your computer detects this Wifi source, scans it, and this Wifi identification process takes up to 50% of the computer CPU ressources, possibly causing crackling. 2) Disable Windows preset made to save energy on the USB. This preset is set on by default, and it may cause crackling in the sound, and even disconnect the DJ controller on the computer. 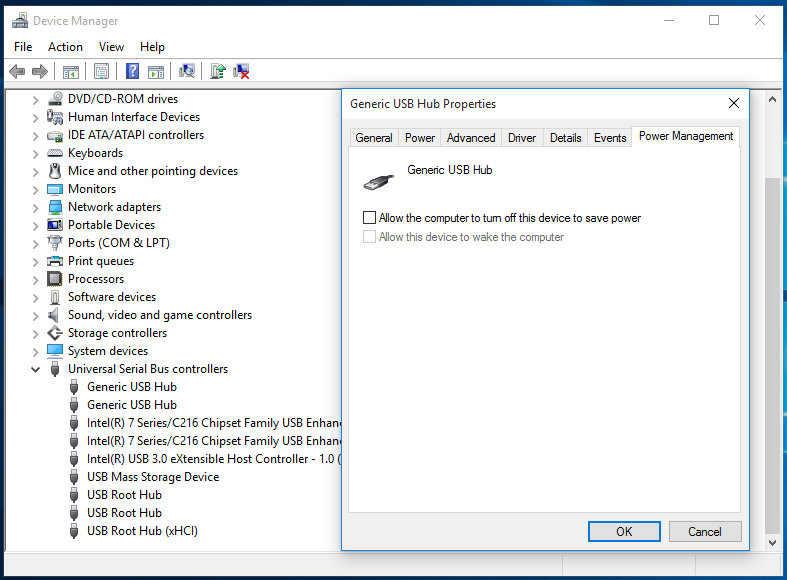 Right-click on the first line "USB Root Hub" and click "Properties"
Go to the tab "Power Management", and uncheck the box "Allow computer to turn off this device to save energy"
Repeat the same operation on each line called USB Root Hub or USB hub. Real time operations as Djing or video capture require to as much CPU ressources as possible, so you should close any other background software during a DJ performance. If the USB port of your mouse is close from the USB port of your DJ Controller, and if you have enough USB ports for it, you should plug the DJ Controller on a USB port far from the mouse USB port, as the click on your mouse may be heard in the audio played on your DJ controller if the USB port are close one from the other. 5) If you are in Windows 7 or in Windows Vista, avoid Aero graphic theme. Aero graphic themes are CPU intensive, so don't use an Aero graphic theme while doing any real-time task as music production or video capture, select a basic theme instead. 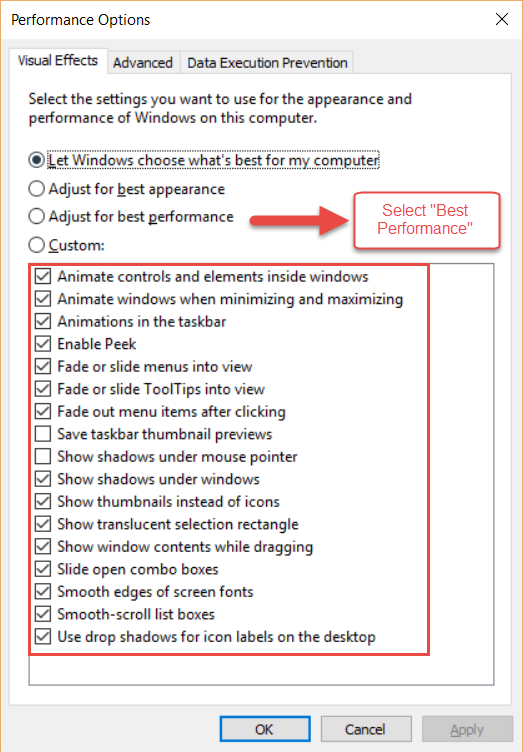 - Click on "Settings" in the "Performance" area. - In "Visual Effects", click on "Adjust for best performance", and press "OK". 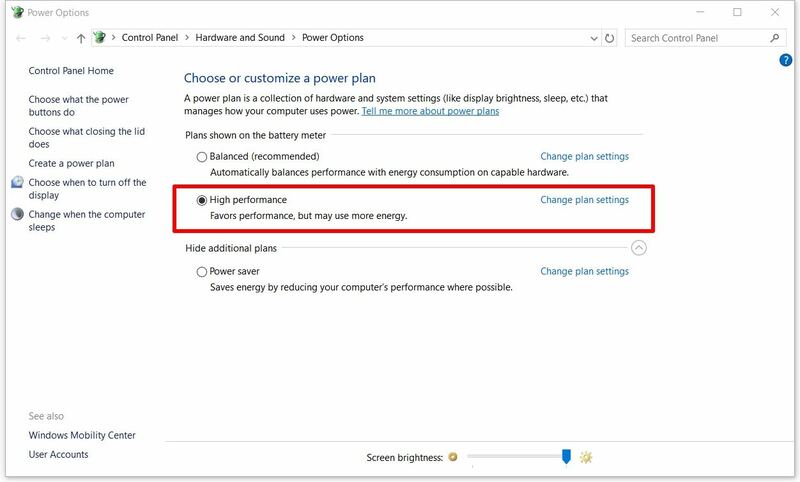 7) If you use a laptop, set your Power plan on "High performance". 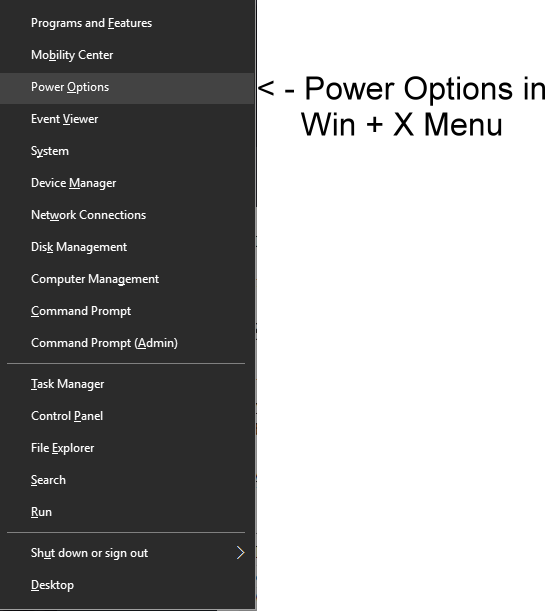 Press Windows + X keys to call Windows X Menu, and select Power Options. In Related settings, click on Additional Power Settings. In "Choose or customize a power plan", select High performance. You can use USB keys to copy an audio track on or from your computer, but once it is over, unplug it from your computer. USB keys have a slow access time (even USB keys with a fast transfer rate have a slow access time), so if they are connected to the computer, they decrease significantly the computer performance even for task which don't use the USB keys. Never play an audio track directly from a USB key: if you uncompress an audio track on a USB key, the access time of the USB key is so slow that you complete computer because slow. If you want to play a track stored on a USB key, copy it on your hard disk prior to playing it. Windows needs hard drive space to be fast, and playing music requires a significant hard disk space. When loading audio tracks, the audio tracks are uncompressed in the software and need, either in the hard drive + in the RAM, the same space as if they were in an uncompressed WAV format, even if they are stored in a compressed format as MP3, AAC or WMA. Vikk has released a tutorial explaining his use of P32 DJ in Djuced 40. El Chapuzas TV has released a very clear spanish tutorial on DJControl Instinct P8. When performing outside, if you find difficult to read your computer display in daylight, you can invert colours on the screen. Choose Apple menu > System Preferences, click Accessibility. Go to the Display section, select "Invert colors". Press on the keys Windows and + to call Windows Magnifier. You can Zoom in/Zoom Out in Windows magnifier with Windows + and Windows - keys. If you see no Magnifier menu, click on the Magnifier icon in Windows task bar to call the menu. In Magnifier menu, select Views > Full Screen. Press on 3 keys (Control Alt i) to invert the colours (and press again on Control Alt i to restore normal colours). Here is a tutorial from DJ Spawn explaining the use of in-jog displays on DJControl Jogvision.